What an interesting experience -- Orlando Evening club was chartered in May, and I was the first Rotarian to bring them a banner! So White Plains is their first flag from another club. How cool is that? 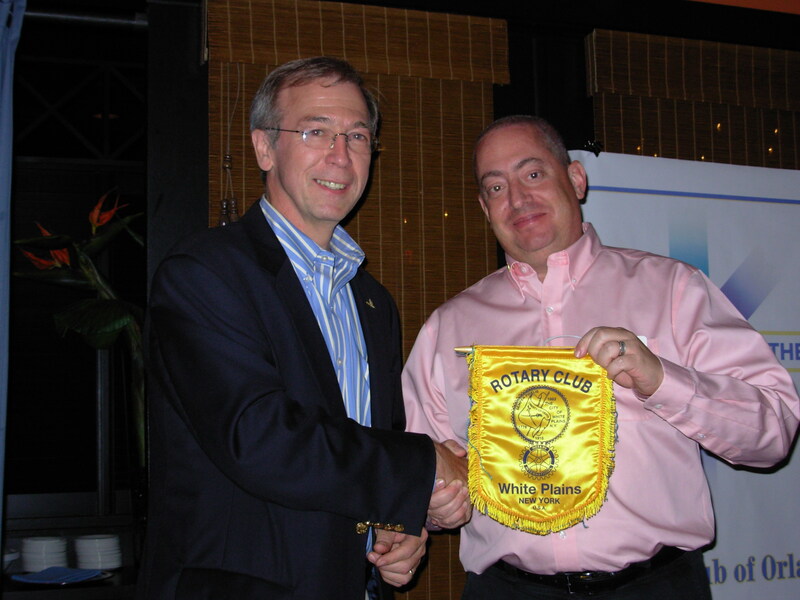 Here I am presenting the RCWP banner to charter President Larry Haber. The club inducted 3 new members the evening I visited (9/19/06), bringing their membership to 23. It was a good environment, with camaraderie among a very impressive group of professionals. They had a speaker, happiness dollars, and a split (no, I didn't win). The restaurant is very nice and the food excellent (Gentry's Wine Bar, $25 for Rotary dinner). All in all, quite nice. Rotary Club of Orlando, September 21, 2006. Here is a big club (230 members) that ran their lunch program very much as we do ours.... welcoming guests the same way, happiness the same way, singing the same way -- a similar program except they are just a bit bigger and better organized. I picked up at least one idea from them, however. 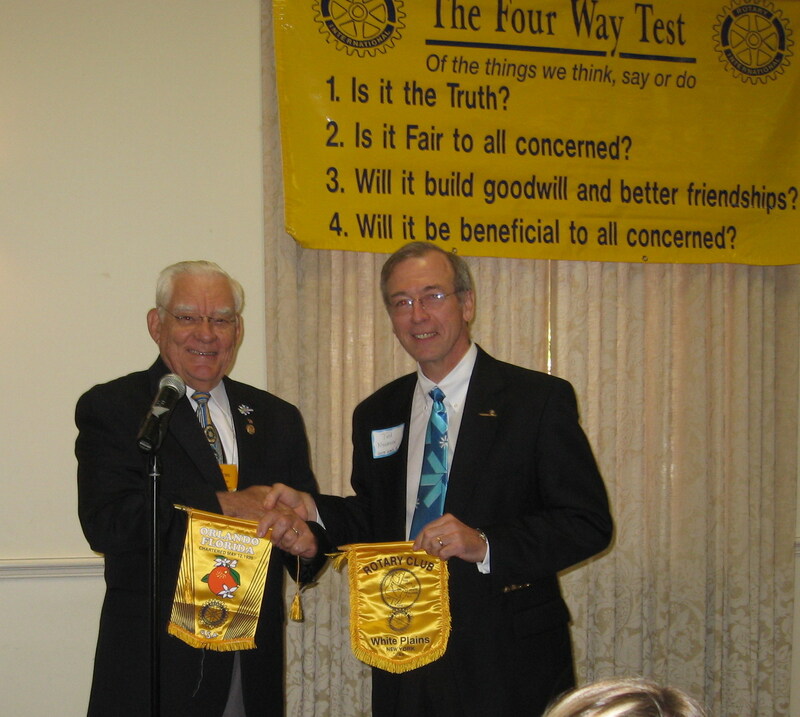 I was the only visiting Rotarian at this meeting, and did a banner exchange with President Jim Stowers. I asked their executive director to send me a copy of their email Bulletin. Among the most interesting things about this club was that they started promptly at noon, and finished by 1:15. It seemed quick; but everyone was punctual and few left before the program -- which was the politician who is speaker-elect from the state legislature (the youngest ever). BTW, they fine you $2 if you leave early, which they call "scooters." More than any other club I have visited around the world, these Rotarians were the most hospitable to me personally, Dozens came up to me afterwards to chat, talk about Westchester County, thank me for visiting, etc. I really felt "at home" as a visitor with this group.